Thinking of selling your local market property and want to save money? Well Maxwell Estates Agents are here to help! We are really excited to be the first estate agent in Guernsey to launch an exciting new way of selling your local market property whilst saving you money! As of now we do not charge Commission Rates we offer you a choice of 2 fixed fees from only £499 you can take an active role selling your local market property by using our premium package, if you want all the bells and whistles that an Estate Agent would charge you on a Commission Rate then our £2,499 premium plus packages is the way to go! Whichever method used to sell your property you can be assured you are using a local well established office based estate agent committed to providing you with the same excellent standards of service including quality property brochures, photographs and marketing that you have come to expect from Maxwell Estates Agents. 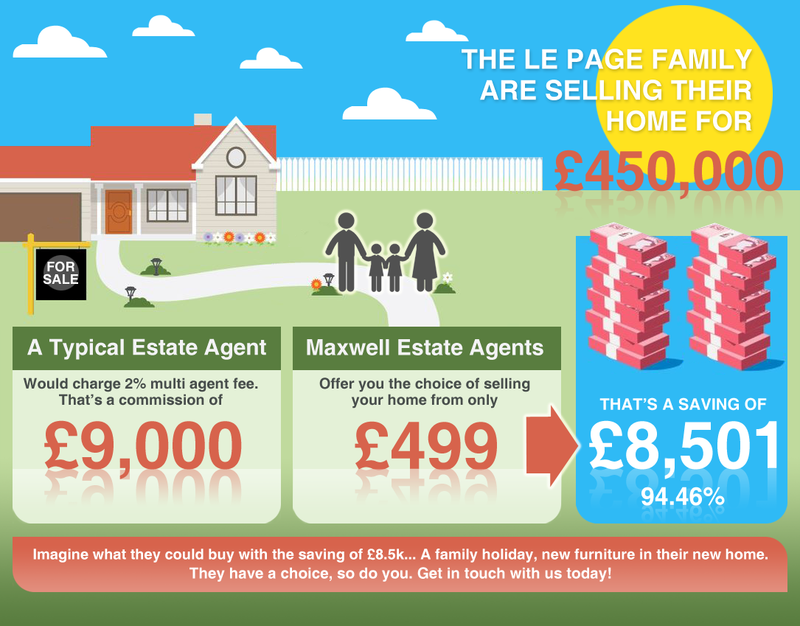 Please see our slider tool below which lets you work out for yourself exactly how much money you can save using Maxwell Estates Agents in comparison to our competitors using our low priced fixed fee services – the lowest local market fixed fee office based on the island! Open Market properties please contact us for our rates. For further information please contact us on 01481 248123 we are available 7 days a week 7.00am – 7.00pm. Fixed Premium and premium plus packages. Here’s how it works once you have read the terms and conditions below and you have decided to use this local market service you make the secure and verified payment and on receipt within 24 hours Maxwell Estate Agents will make contact with you and arrange to take on your property – what could be simpler? Do contact us on 01481 248123 – We’d love to help save you money that you can either spend on you or your family or on your new home! WE PHOTOGRAPH YOUR LOCAL MARKET PROPERTY. WE PRODUCE A PRESENTATION COLOUR BROCHURE. WE UPDATE YOUR PROPERTY TO OUR WEB SITE. WE CAN PROVIDE A WINDOW FOR SALE/RENT SIGN. WE INFORM YOU OF VIEWING DETAILS FROM INTERESTED PARTIES. YOU SHOW INTERESTED PARTIES AROUND YOUR HOME. YOU SELL/RENT YOUR GUERNSEY HOME TO A WIDER AUDIENCE. OUR ADVERTS DRAW PEOPLE TO OUR WEBSITE PROPERTIES. PAYMENT UP FRONT EITHER BY DEBIT / CREDIT CARD. WE OFFER NO REFUNDS FOR USING OUR SERVICES. WE DELETE YOUR PROPERTY ONLY WHEN IT’S SOLD OR WHEN YOU INFORM US. IF YOU REQUIRE EXTRA SERVICES NOT STATED ABOVE WE CHARGE. THE ENTIRE £499 PREMIER PACKAGE. WITH THE £2,499 PACKAGE WE DO NOT CHARGE ANY EXTRAS. DISPLAY YOUR PROPERTY WITHIN OUR OFFICE. ROTATE YOUR PROPERTY IN OUR WINDOW DISPLAY. ARRANGE VIEWINGS AND SHOW INTERESTED PARTIES YOUR PROPERTY. NEGOTIATE ON YOUR BEHALF RE OFFERS. DRAFT UP CONDITIONS OF SALE AND FINAL CONDITIONS OF SALE. LIAISE WITH YOUR ADVOCATES AND THE SURVEYOR. IN FACT THE WHOLE ESTATE AGENT PACKAGE THAT YOU WOULD BE CHARGED BY PAYING COMMISSION RATES TO OTHER ESTATE AGENTS THIS REALLY IS A NO BRAINER. Use the sliders on the calculator below to see how much money you can save when you sell your home yourself using one of our unique packages. Since opening our office on the Bridge we have been at the fore front of reducing costs in selling your local market home in Guernsey so that instead of the Estate Agent pocketing huge commission rates, you our Client pockets the savings made in instructing Maxwell Estate Agents Limited (an office based estate agent) to sell your property through a fixed fee, with the savings you make, you can either spend it on yourself or your family, even if you save a minimum of £1,000 it surely must be better in your pocket than an Estate Agents pocket?